San Francisco’s United Nations Plaza, located adjacent to Market Street, is the gateway to City Hall, and at night offers one of the best views of the Civic Center Plaza. Named after the United Nations, whose charter was created in San Francisco, UN Plaza is another city park which displays San Francisco history and culture. 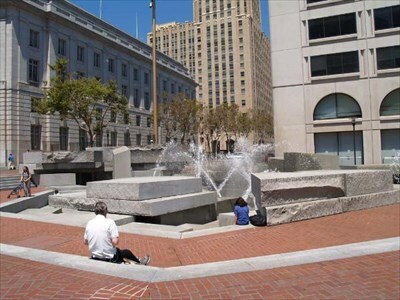 The plaza is surrounded by both the Asian Art Museum and the SF Main Public Library, and contains several historic statues and a fountain. A weekly farmers market, called the “Heart of the City Farmers Market”, is a diverse and popular attraction for locals. Both BART and MUNI underground have a station located within the plaza, allowing easy transportation to the site.